On September 30, 1991, a military coup under the leadership of Lieutenant General Raoul Cedras overthrew the government of Jean-Bertrand Aristide, the first popularly elected president in Haitian history. President George H.W. Bush called for the restoration of democracy, and worked with the Organization of American States (OAS) to impose a trade embargo on all goods except medicine and food. During his 1992 presidential candidacy, Bill Clinton criticized the Bush administration for its policy on refugee return and promised to increase pressure on the military junta by tightening economic sanctions. USS America enroute to Haiti in September 1994, with a unique complement of U.S. Army Special Forces and the 160th Army Special Aviation Regiment embarked. Unburdened by the Cold War international framework that structured U.S. foreign policy for nearly fifty years, the Clinton administration sought to outline new objectives for U.S. foreign policy, including novel uses for military power. Ambassador to the United Nations Madeleine Albright outlined a U.S. policy of “assertive multilateralism,” with an increased role for the United Nations. National Security Advisor Anthony Lake emphasized the role of economic power in the new world order, and argued for a U.S. role in the “enlargement” of the community of free nations. The new administration, however, faced multiple challenges in the former Yugoslavia, Somalia, North Korea, and Haiti that complicated their attempts to implement the broad strategies and objectives defined by the administration’s leaders. Clinton appointed Lawrence Pezzullo as special envoy for Haiti, and as promised in his campaign, worked to increase economic and diplomatic pressure on the junta. On June 16 the United Nations voted to impose a ban on petroleum sales to Haiti. Cedras agreed to participate in talks sponsored by the United Nations and the OAS. The so-called “Governors Island Accord” signed by Aristide and Cedras on July 3 called for Aristide’s return to Haiti by October 30, 1993, an amnesty for the coup leaders, assistance in modernizing the Haitian Army, and the establishment of a new Haitian police force. The agreement provided for the suspension of U.N. sanctions once Aristide had assumed office in Haiti. 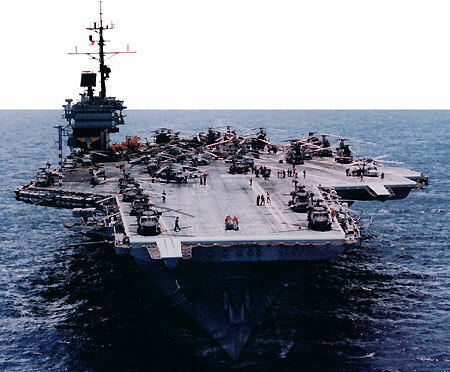 Despite indications that the Haitian military was backing away from the agreement, the United States dispatched the USS Harlan County with 200 U.S. and Canadian engineers and military police on board to prepare for the return of Aristide. On October 11 the ship was met at the pier in Port-au-Prince by a mob of Haitians, appearing to threaten violence. With the street battle in Mogadishu only a week past, the administration proved unwilling to risk casualties in Port-au-Prince. The ship pulled away the following day and returned to the United States, a significant setback for the Clinton administration. Four days later, the United Nations Security Council imposed a naval blockade on Haiti. Through the following months the administration pursued a dual strategy, planning for military intervention while hoping that the threat of a U.S. invasion would coerce the Haitian leaders to surrender power. Pressure toward action continued to build, with Congressional Black Caucus members especially vocal in demanding an end to military rule in Haiti. The Clinton administration built the diplomatic foundation for the operation in the summer of 1994, working to secure a United Nations Security Council Resolution (UNSCR) authorizing the removal of the Haitian military regime. On July 31 the Security Council passed UNSCR 940, the first resolution authorizing the use of force to restore democracy for a member nation. It provided for the reinstatement of the Aristide government and a six-month mandate for the United Nations Mission in Haiti (UNMIH), which would maintain order after the operation. The U.N. mandate authorizing the intervention enabled the administration to recruit forces from Caribbean nations to serve in the post-invasion security force. In early September planning and preparation for the invasion was completed under the code name Operation Uphold Democracy. The invasion force numbered nearly 25,000 military personnel from all services, backed by two aircraft carriers and extensive air support. Although the United States provided the vast majority of the forces, a multinational contingent from Caribbean nations agreed to serve in an operation conducted under U.N. mandate. The addition of these multinational forces shifted the operation from a U.S. military intervention to U.N.-sanctioned multinational action. The operation was scheduled for September 19. With military action clearly imminent, former President Jimmy Carter led a delegation to Haiti in search of a negotiated settlement. Carter, Senator Sam Nunn, and General Colin Powell flew to Haiti on September 17, well aware that they had little time to reach agreement. President Clinton approved Carter’s mission, but insisted that the military operation would proceed as scheduled. The invasion forces launched with the negotiations in progress, without any certainty whether they would make an opposed or a peaceful entry on to Haitian soil. The Haitian leadership capitulated in time to avoid bloodshed. Having launched the operation with the expectation of a forced-entry assault, the forces conducting the operation displayed remarkable discipline and flexibility in adjusting to this new and uncertain environment. General Hugh Shelton, commander of the invasion force, was transformed enroute to Haiti from commander to diplomat, charged with working out a peaceful transition of power. Shelton and Cedras met on September 20, 1994, to begin the process, and Aristide returned to Haiti on October 15. Military planners had defined the conditions for hand-off to UNMIH as the restoration of basic order, the return of Aristide, and the conduction of a presidential election and subsequent peaceful transfer of power. The operation ended with the transfer to UNMIH command on March 31, 1995, and a peaceful election and transferal of power occurred on February 7, 1996. The operation yielded important lessons about the complexities involved in managing complex contingency operations, which were captured in PDD/NSC 56, “Managing Complex Contingency Operations,” issued in May 1997.